Skin care has always been super important to me, and the older I get, the more and more important it becomes. My sister-in-law is about to graduate from esthetics school and she’s totally gotten me into exfoliating. She just got me these exfoliation gloves that are INCREDIBLE! Basically, they kind of work like a loofah but they are little more rough so they take all the dead skin off. After I get out of the shower and lotion up, my skin feels absolutely amazing (seriously you need to try it). It’s super important to moisturize after you exfoliate so lately I’ve been using EOS Body Lotion. I’ve always been a huge fan of EOS (have you tried their lip balm? I couldn’t live without mine, I have about 10!!!) and their lotion is just as amazing. It’s moisturizing, smells SO good (the two options are Berry Blossom and Delicate Petals), and leaves my entire body feeling and looking smooth and soft. I use to get these weird bumps on the back of my upper arms and since I’ve been exfoliated several times a week and putting on my EOS lotion they’re almost gone! Especially with being pregnant, I’ve been trying to keep my skin healthy and hydrated (trying to avoid stretch marks) so I’m glad I have my new little skin routine because I really can’t believe the difference in my skin. What are some of your beauty secrets for healthy skin?! Brought to you by EOS. Ahh I currently use this lotion and LOVE it! It smells amazing and is totally moisturizing :) Your pictures are adorable btw! I love the EOS brand! So I am not surprised that the lotion is amazing! I feel your blog has turned into a commercial. A week doesn’t go by without an ad – Hersheys, Dasani, Eos, etc. I get that you are a business, but this is really taking away from your authenticity. Rachel, where are your bedside dressers from?! I love your home. Your bedroom and bathroom are so elegant. Serious lifestyle inspiration!!!!! Oh my gosh thank you so much Rochelle! I love your blog too!! Rochelle, I agree with you, the whole house decor is beautiful, Alice Lane at Home knows what she’s doing. What kind of exfoliation gloves do you use Rach? You two are so adorable!!! I haven’t tried EOS body lotion but I love their lip balms. I have been using First Aid Beauty because I also get those weird bumps on my arms and it has helped those disappear too! Cute pictures of you and Isla! Hi Rachel- beautiful pictures as always!! Isla is adorable and your bedroom decor is so beautiful! I cant wait until we get to see the rest of the house decor one day! I get those bumps too (pretty sure they are little clogged hair follicles..). What exfoliating gloves did your sister-in-law recommend? I’m really interested in giving that a try if it helped you! Looks so fresh and wonderful! Hope you have a great weekend babe!! Rachel, I love to see how happy you’re always on your posts with the baby and puppy and family in general. Happy girls are the prettiest girls right?! I’m all about good skin care products, I personally wear Kiehl’s but these products sound fantastic and plus they come in pretty pink bottles. Have a lovely weekend! I have a small thing of their hand lotion that I love! Feels so nice and smells amazing. I’ll have to give the body lotion a try. Moisturizing is a must living in Vegas! Love the EOS lip balm, need to try their lotion!! Sounds great! I should try it. 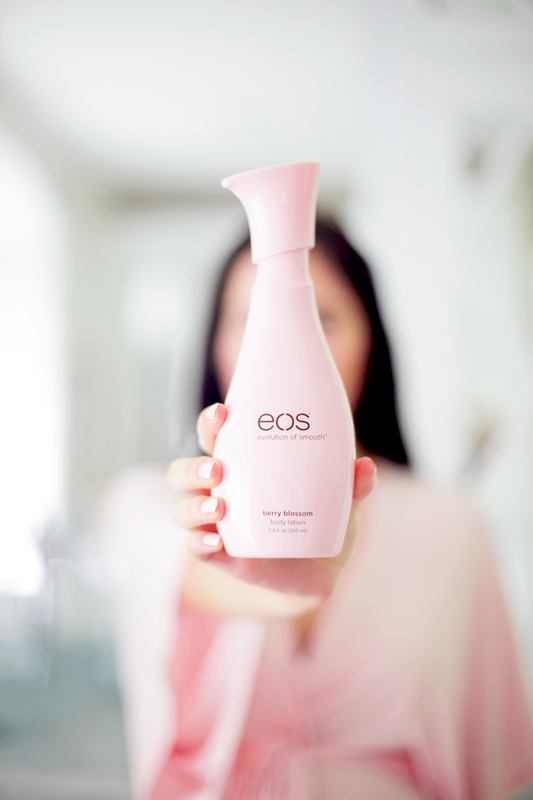 I haven’t tried the EOS moisturizer yet but I keep hearing great reviews on it! I haven’t tried EOS body lotion before only their chap stick. I will have to test it out the next time I’m need of lotion. Thanks fro sharing! I love the quality of the eos lip balms, so I’ll definitely be trying their new lotions! Such a good post. I love hearing about your skincare routine. What a great resource your sister-in-law is! 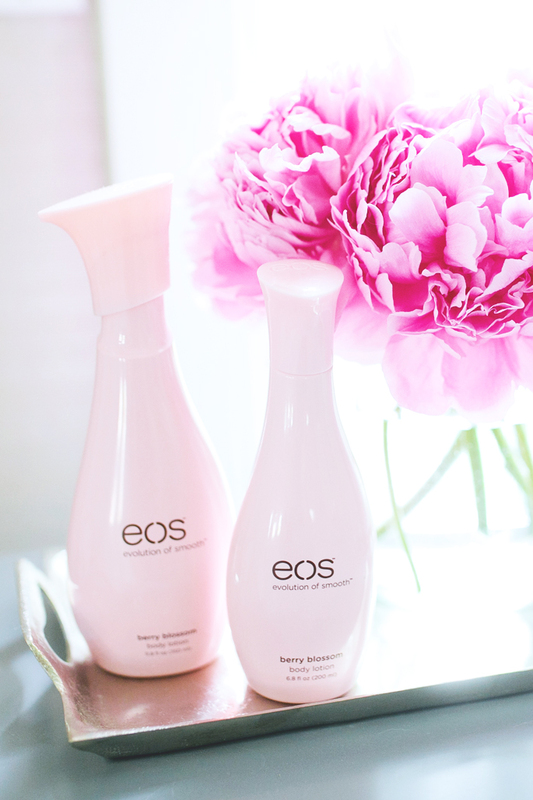 I love EOS brand and I also have 10+ lip balms which are the absolute best! Speaking of skincare, have you looked in to Rodan and Fields? If you are interested in getting some more info, send me a message. The bumps that you got on your body is from cows milk. My mom is a nurse and is very into research. She is vegan and does not have ANY bumps! My skin care seceret is to take a shower every single night. Then put some kind of lotion from Trader Joes. (My favorite store) And I have seen your post about honest. Anyway, I, also use honest chapstick. It is orange, they also have a blue one but it has no taste. You really should try drinking coconut milk, made by “so delicious”. It is hard to find in some stores. You can also try soy milk. I also LOVE your posts! I second the comment about bumps on upper arms due to dairy consumption. My husband, daughter, and my son will get them when we don’t watch our cheese/milk intake. When my husband and I did Paleo, his bumps disappeared. I actually didn't knew that EOS has these products, only knew about the amazing lip products. i had three daughters and with each one gained nearly 50 pounds- not one stretch mark. As soon as my belly started growing, I bought extra large white T shirts and sticks of cocoa butter. Every night I would go back and forth over my belly with Cocoa butter and wear the T shirts to bed so wouldn’t mess up my bedding. My skin was so soft and moisturized that not one line developed. I’m 5’10 and that whole 50 lbs was basically gained in the trunk area- so-it really works! You and your spouse just have to tolerate the smell of chocolate- we grew to love it! As long as you shower every morning nobody else will know! Thats so amazing Tammy. Seriously I moisturize so many times through out the day, so using a good lotion is definitely important! Great post! I’ve been told by my dermatologist that exfoliating is the one best way to keep your skin looking young and glowing. You should try Dr. Denese’s Advanced Firming Facial pads. They are an exfoliating pad you swipe over your face each night (they contain glycolic acid) and they work wonders! I will use them forever! Will definitely have to try the EOS lotion! You have to try the Rodan + Fields Microsermabrasion paste! That got me hooked on R+F and I love how my skin looks since I started exfoliating too! I will have to try out this lotion! Thanks for sharing your beauty tips, always love your posts, and congrats on the 2nd sweet bundle headed your way! Seriously its the best! You would love the EOS lotion Trisha!! Thanks so much we are so excited for our little family to be growing! Love Eos chapstick, will definitely try their moisturizer, didn’t know they had on e until now. Will be great for that summer glow. Adorable pics of you and Isla!! I wonder where your pale blue bed throw/bedspread is from? Great post! Beautiful photos!! Love Barefoot Dreams items!!! What brand are the exfoliation gloves? I would love to try them! Thanks!! I love this post! little isla is beyond cute. and i am obsessed with all of your robes! I have a question…. where are your oversized pillows on your bed from? I have been looking for something like that forever. thanks girl! Thank you so much Alee! Love Isla’s little surprised face!! Love you Rachel! Where are the expoliating gloves from? And if you don’t know which ones would you recommend? The baby is so cute….Really a good article with nice pictures.